Mold Damage can not only destroy your furniture, but destroy your personal items such as books, photographs, and other precious items. Orange Restoration San Diego can help with Mold Damage Remediation. In many cases, when water and mold damage occurs, you aren’t always prepared for the aftermath when it comes to damaged personal items like books and photographs. Even a relatively small amount of water encroachment can cause a lot of damage to your belongings. Furniture can be easily replaced but when it comes to family pictures, heirlooms and books, it may seem an impossible task to restore such irreplaceable items. Fortunately, you have options. The best way to ensure that as many of these valuable items as possible are saved is to bring them to a restoration specialist. However, before you take that crucial step, there are things that you can do to prepare. Because mold damage can start in as little as 48 hours, beginning the restoration process immediately is imperative for salvaging your property. Once mold growth begins, the task of saving your personal items becomes very difficult, yet not impossible. The first step is obvious: you should immediately remove all of the items from the standing water and, if possible, rinse them with cool, clean water. 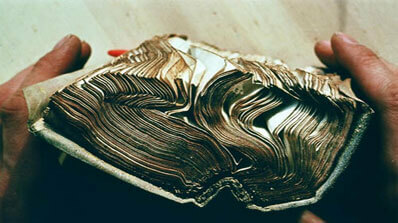 Once all items have been rinsed, you can shake books and photographs to begin the drying process. This may sound odd, but the best way to begin drying your books is to place them individually in a plastic bags and place them in the freezer. Saving photographs from water and mold damage is more difficult than salvaging books, unfortunately. Photographs are known to stick together because of coatings and emulsions, as well as to other items that they come in contact with. You can attempt to separate the photographs by soaking them in warm water and then apply very light pressure, gently separating them. Avoid coming into contact with the image itself, otherwise you risk further damage to the photograph. Once the photographs have been separated, you can place wax paper in between them and place the photographs in the freezer alongside your plastic-bagged books. After taking the important initial steps listed above, you can then bring these items to a local restoration specialist. At Orange Restoration we will do everything possible to help you salvage and restore as many of your valuable, personal belongings as we can. We are content cleaning specialists and have years of experience in restoring items to their original state. If you are experiencing any mold damage it is crucial you contact an experienced restoration company ASAP! At Orange Restoration, all of our technicians are fully certified and trained in all facets of damage restoration. We will respond quickly and get your property back to its original state in no time at all. We are available for 24/7 emergency services. Give us a call today!